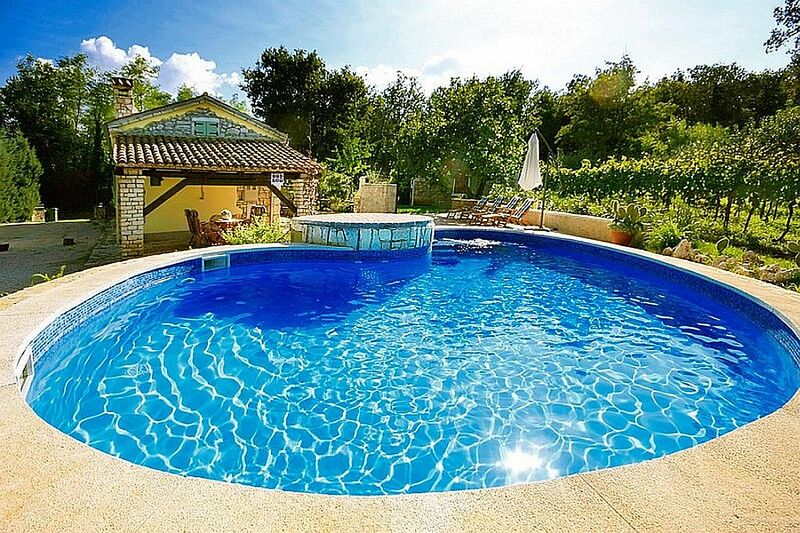 Casa Corona is a traditional istrian house (semi-detached) renovated in authentic style located near the village Zupanici only 10 km from Labin and 15 km from Rabac and the beautiful beaches away. The house was built at the end of the 19th century and renovated in 2004. During the reconstruction of the house traditional materials were used to preserve its originality so the guests can enjoy life as it once was in an istrian home, of course with all the benefits a modern holiday home can give. Situated on an garden of 20.000 sqm with a vineyard and numerous fruit trees it offers its guests also a 32 sqm open pool with sun chairs, barbecue fireplace, covered terrace with sitting set, a terrace covered with vine and table with benches, konoba (typical istrian tavern) and a parking space. The house owner does not live on the property and the other half of the house is for rent also. Holiday house for 4 persons with a living area of approx. 50 sqm. The ground floor consists of a fully equipped kitchen with dining table. From the kitchen you can approach an open gallery on the attic with two single beds and a sofa, ideal for children. Only two stairs lower from the kitchen there is a bedroom with one double bed and a shower/toilet.